Key West Police Chief Sean Brandenburg, during an awards ceremony Friday at the Grand Key Resort, awarded Officer Bryan Tyler the department’s Life Saving Award. Photo: Key West Police Department / Facebook. An officer with the Key West (FL) Police Department who disarmed and took to safety a distraught and suicidal man late last year has been awarded that agency's Life Saving Award. Officer Bryan Tyler reportedly stopped the 41-year-old man—who has only been identified as a non-resident of the area—on his motorcycle for a traffic infraction. The man reportedly presented a weapon but Officer Tyler was able to disarm him, according to the Miami Herald. 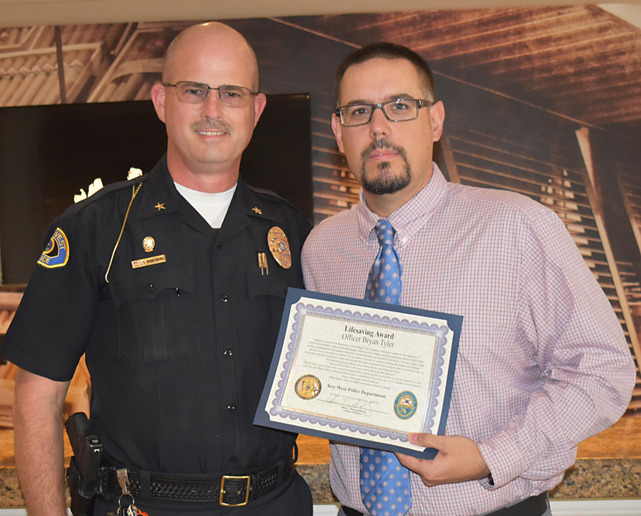 Chief Sean Brandenburg told the Herald, "Officer Tyler's watchful eye and professional compassion saved the life of a stranger during his darkest hour. Not only that, but Officer Tyler's skill and professionalism averted a serious threat not only to himself, but to his fellow officers who responded as backup."